Norwegian Reward, the loyalty scheme of low-cost airline Norwegian, has added Groupon UK to its growing list of partners where members can earn points toward discounted and free Norwegian flights. The award-winning loyalty programme is fast approaching one million UK members who benefit from exclusive bonuses and discounts. The scheme is attracting members by partnering with popular consumer brands to give members more ways to save money on Norwegian flights including new direct services from London to Singapore, Buenos Aires, Chicago and Austin. 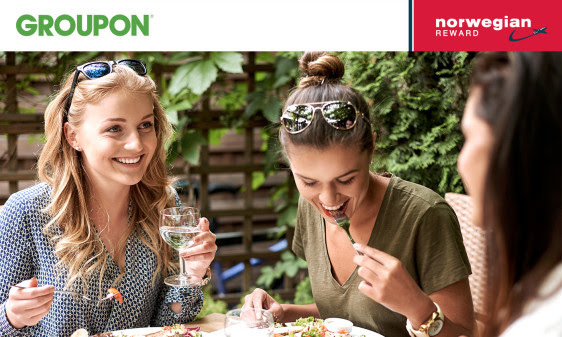 Norwegian Reward members can now purchase any Groupon UK offer and earn up to 10% of the purchase value in CashPoints – the loyalty’s programme’s currency. CashPoints can be used toward the cost of flights and extras such as baggage, meal service and seat reservation. To celebrate reaching 6 million Norwegian Reward members, the airline is running an exciting competition where you can win 10,000 CashPoints - enough for a return Premium ticket to most of their long-haul destinations. It's such a simple competition, all you need to do is spot the special aircraft that's had its livery amended to reflect the impressive number of members. If you spot the aircraft, all you need to do is share it via social media with the hashtag #norwegianreward and that's it. To help you just follow this link and you'll find out where the special plane is right this second (well ok, maybe a few minutes ago, but pretty darn close). Full details of the comp can be found here.